As I think back to the time when I was in kindergarten, I realize how much has changed. What was once naptime, coloring, painting, and running around the playground at recess, is now a place for reading, writing, sitting still in your chair and an introduction to math facts. Even preschool is now more focused on academics and many of them tailor their lesson plans to higher learning subjects that normally wouldn’t begin until kindergarten or first grade. While this push for greater academic achievement is good in theory, we are now seeing digression, even negative consequences in our students’ learning capability because their development is being pushed too far too fast. 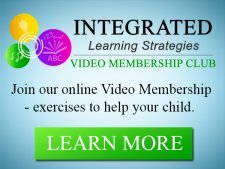 A child’s motor planning (jumping, bouncing running), auditory (retaining letters and sounds, listening to the teacher), and sensory input (behavior, focus, attention), and organizational skills used for math, in many cases is now suffering because we did not allow our children adequate time to develop these critical milestones used for helping the left and right sides of the brain work together. One of my students in particular came to me with auditory processing issues because his parents couldn’t figure out why he wasn’t retaining the information he was learning in the classroom. 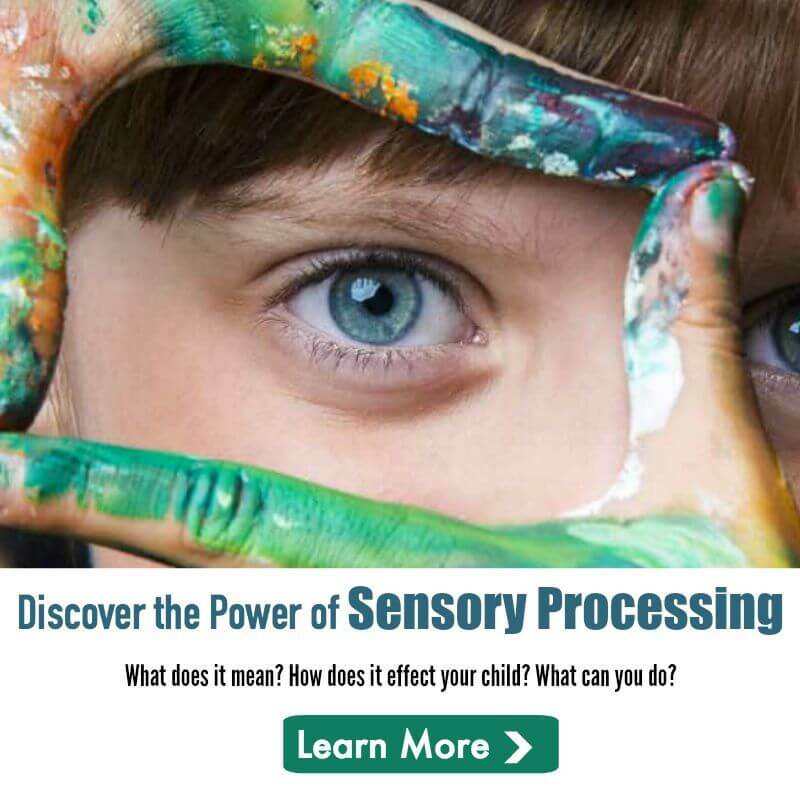 “Ethan was struggling with auditory processing, including following directions and instructions from the teacher, tasks at home, and overall challenges with comprehension and the written word,” said Katie, Ethan’s mother. So what she is really saying is we need to find the right ways our children learn and implement those not only in the classroom, but tailor our learning techniques to the unique needs of the child. What works for one student doesn’t always work for another, especially those with ADHD, Autism, Sensory Processing Disorders and Dyslexia. With Ethan, I knew we had to start from the beginning before we could even begin working on higher learning concepts like reading, comprehension, writing and math. 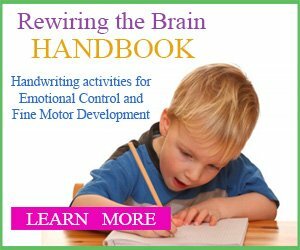 The first step was to help him with brain-building exercises or purposeful movement activities to activate the right and left sides of the brain. 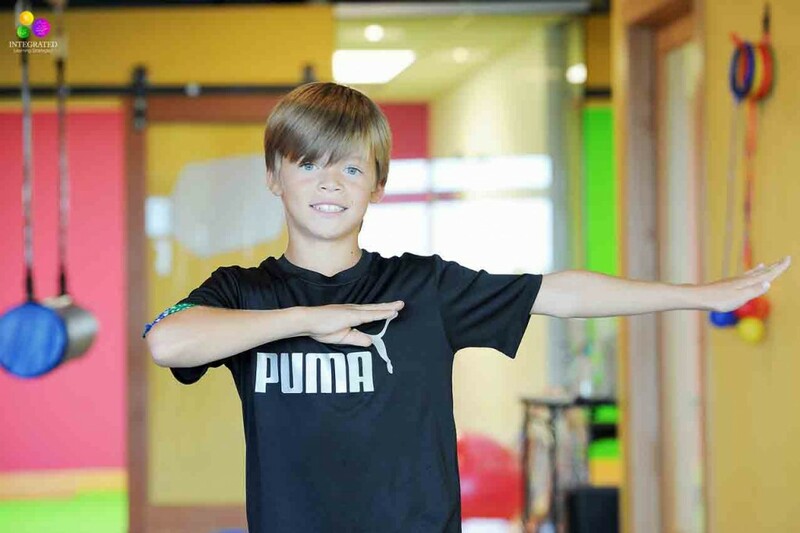 Oftentimes parents think their kids are athletic or even wonder why hyperactive kids who move all the time aren’t better learners, but the key is using specific types of movement that connects the body with the brain. This is what we call crossing the midline. Remember, the body is divided left to right, top to bottom, front to back. We need to help our kids participate in activities that will directly target each of these areas. 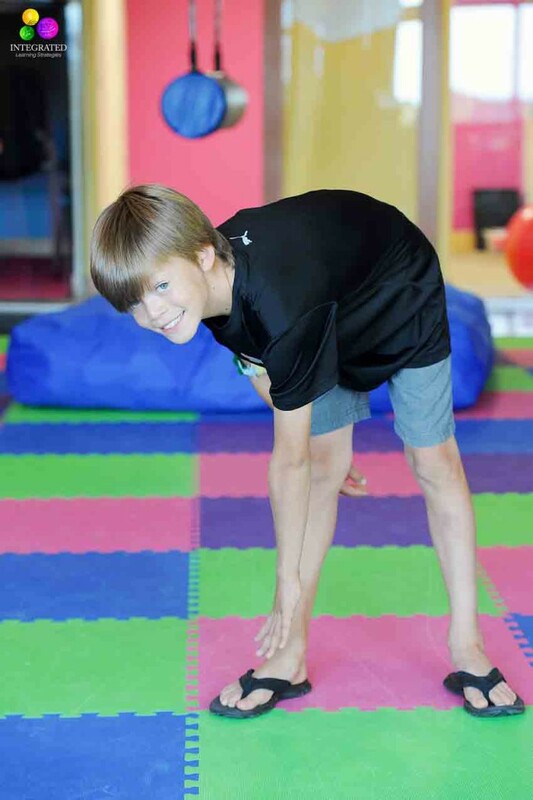 Today, we are only focusing on exercises that will help improve your child’s right and left sides of the body so think of the body being cut in half from the top of your head to the bottom of your torso, just like an orange. 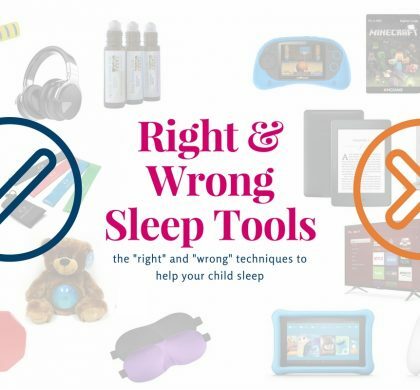 The goal is to cross both your child’s legs and arms over that imaginary midline dividing their body from left from the right. Here are some of the activities to try at home. You may think they are pretty easy and basic, but you’d be surprised at how many children cannot do these movement-type exercises. You may need to clear some room in your home, but you don’t need too much room to get started. You can also do these activities all year long, even during the winter months. All exercises should be repeated 10 times using alternating legs and arms for 20 minutes each day. For this exercise, you want your child to stand with their legs together and then have their right elbow touch their left knee. Switch from the left elbow to the right knee. 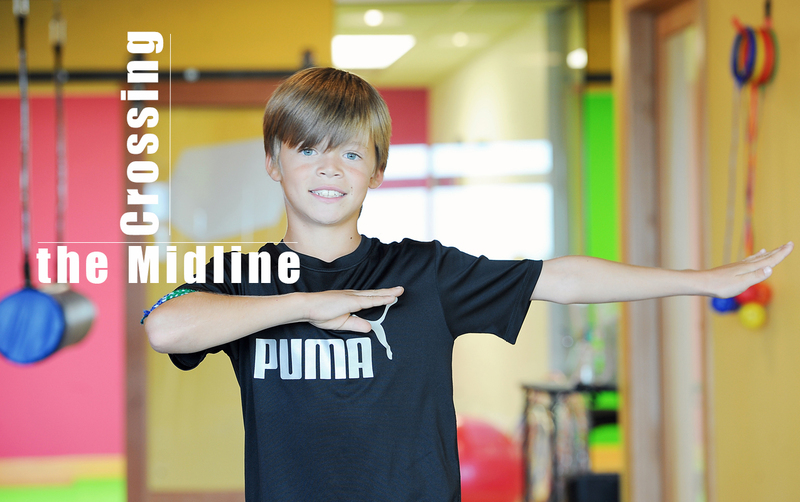 Make sure your child crosses our imaginary midline of the body. 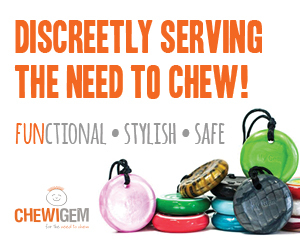 We want to ensure the movement is precise and slow so children don’t complete the exercises too fast or too sloppy. 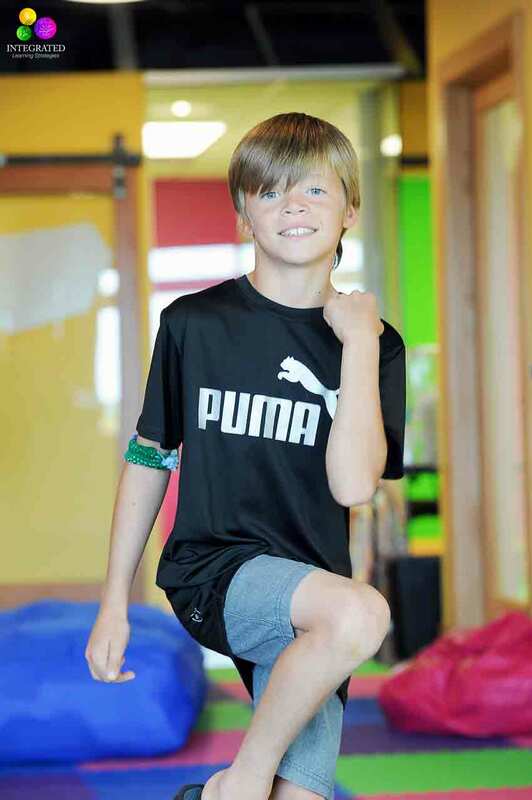 Wrong Way or What to Watch for If your child has a tendency to put their right elbow to their right knee this is a red flag. It means they are struggling to cross one side of their body over the other, which could be why their right and left sides of the brain aren’t working together. If they can’t cross the midline, you will need to physically help them put their left elbow to their right knee or vice versa. 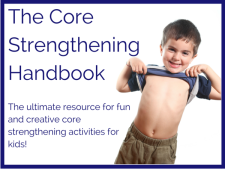 Children with poor muscle tone, coordination and balance may also struggle with this activity so you may need to help them at first until they have built their strength. This activity uses the arms as opposed to the legs. You can have your child stand shoulder width a part and then have them cross their right arm to their left shoulder and back again. Remember to help your child touch their right hand to their left shoulder and vice versa. Movement should be completed slowly and accurately. 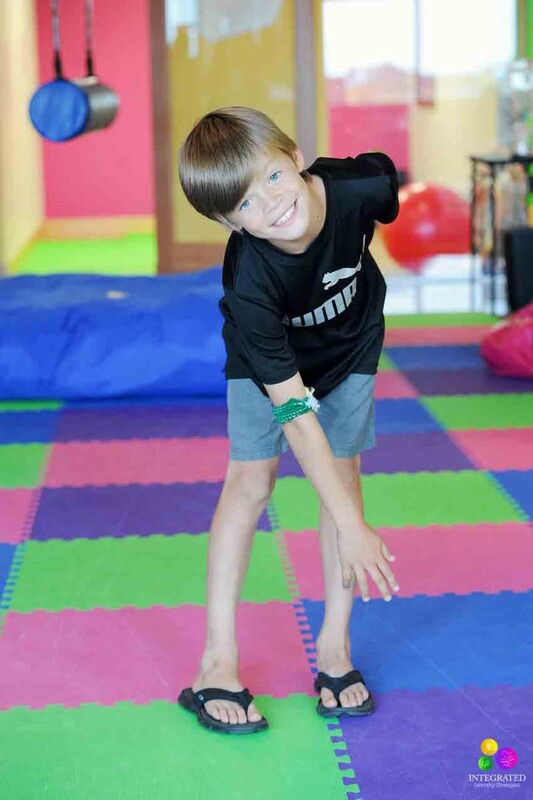 Wrong Way or What to Watch for If your child’s right arm doesn’t make it over to the left shoulder (maybe they only got half way), they are not crossing the midline and will not get the full benefit of the exercise. You may also see your child swinging too far back or way over the midline. This also prevents them from getting the full benefit of the exercise. 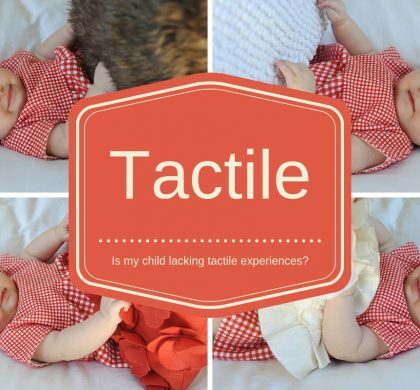 This activity can be altered based on the child’s age. If the child is younger and smaller, you may want to begin them with toe touches first before doing leg extensions. If you have tiles in your floor or a square surface, help your child stand shoulder width apart in that small area. Have them put their hands on their hips and then extend their left leg over the right side of their body, crossing the midline. Then have them try the other leg over the other side of the body. Help your child with slow and accurate steps to ensure full benefits of the exercise. Wrong Way or What to Watch for Your child may struggle with balance so you may have to help hold their waist to prevent them from falling over. If your child can’t stay within their square, you will have to remind them to stay in the selected area. Watch your child to ensure their shoulders are square during the movement and that they are not crossing their full body over to the other side. Only their legs should cross the midline. This makes total sense! I wish that schools were not so focused on academics. We have forgotten that kids learn while they play and move. I am going to have to try this! That is very true! It is really sad that more schools aren’t focused on movement activities. It really can help the kids learn better in the classroom. Academics will come if we let those development stages take its course. Let me know how it goes with your kids! What age would say a child needs to be to do these movements? I work with birth to 3 years population. We have started children as young as 3-years-old with these types of movement. Recently we have been working with a child who is two and a half because he is struggling with speech issues. He is already making great progress. I think age three is a good place to start all the way up to 18 years of age. It can also help adults as well if there were severe developmental delays as a child. Let me know if you need any more details. I see a lot of comments here stating that they wish schools were not so focused on academics. I am a district administrator and educator and would like to clarify some things. An assumption is being made that educators are not integrating movement into learning. While there are some teachers that continue with traditional ‘sit and get’ instructional practice, there are many more that have embraced new learning and have implemented best practice including cross midway activities, culturally responsive teaching and integrated instruction to name a few. It is in these classrooms that we are seeing much success in learning and student achievement. That being said, there are still barriers for teachers in this area. Because most of us as adults did not have this experience in school, many parent groups, school boards and legislators to not allow teachers to move forward with these high operational practices that elicit high intellectual performance. I work in a very progressive district, however, my son attends a very traditional school. He has been diagnosed with ADHD and struggles in the traditional classroom. I do as much as I can at home, but if the district administration does not provide professional learning on effective instructional practices and insist on implementation of such practices, our children will suffer and the fall in achievement for American students will continue. It is not always about teachers. It is many times about the greater community and government. Thank you so much Carla for your response. We completely agree with you! Many times teachers and educators are restricted by school requirements or government programs. 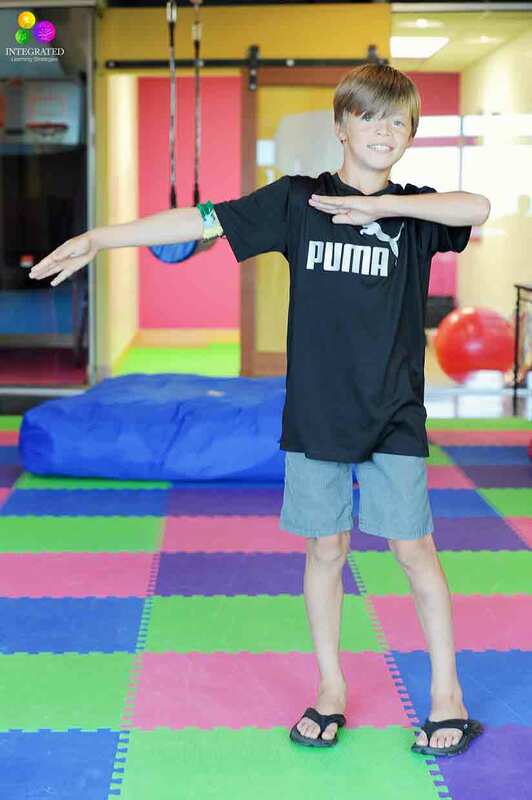 It is exciting to see many teachers using movement in their classrooms and doing all they can to promote movement-based activities to help their students (see to Washington Post video within the article). There are definitely those teachers that believe in the “sit and get” instruction practice as you suggest, but we are seeing more teachers implement movement as more awareness is created. Our goal is to support teachers in their efforts. In fact, we do this with our local schools and principals. Many students are sent to us by teachers and principals within our area. We hope that governmental parties will see more of these benefits and will tailor legislation to reduce the number of standardized tests and programs that are hindering our students’ education (for example, the Dibels test). Thank you for your great comment and we hope to hear more from you as we post more articles. I would be much happier reading this if whomever wrote, edited or posted it had actually READ it prior to posting. I am so saddened to read incomplete sentences ‘written’ by a teacher I’m almost at a loss for words. Hi Jonathan, thank you so much for your feedback. We appreciate your honesty and creating awareness of the content within the article. Due to the timeliness of the article and our partnership with our media outlet, we posted the article too hastily without having our editor proofread the information. We have since reviewed the article and revised it to update inconsistencies. Just to clarify, we are not teachers and cannot claim to be. We provide several services for educating students and have many certifications and programs to assist in reading, writing, spelling and math. All of those topics are covered by professionals who have certified degrees within their expertise. Thank you for your feedback and for reading our articles. 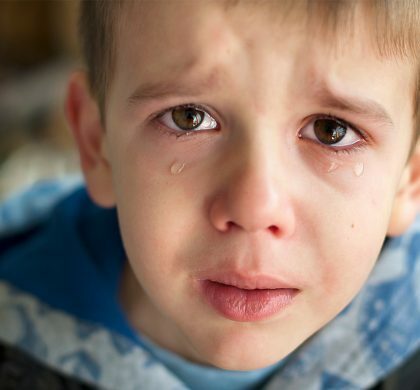 Hi Sharon, many children who struggle with learning challenges or learning disabilities have a disconnection in the brain, which prevents the left and right hemispheres of the brain to work together. This is what can cause behavioral issues and delays in learning. Our goal with the movement-based activities is to build neural pathways in the brain so the two sides are integrated or begin “talking” to each other so the child can perform at a higher level. Here is a concrete example of how movement-based activities helped one of our student’s handwriting: http://www.ilslearningcorner.com/2015-10-what-your-childs-handwriting-and-fine-motor-skills-may-tell-you/ We have several other examples, but those will come in future articles. Thanks for your great questions. My granddaughter, age 6, was born with spina bifida and although very bright, is having some trouble in first grade with listening and following directions. She definitely has balance problems, and would need to have assistance to perform these exercises. 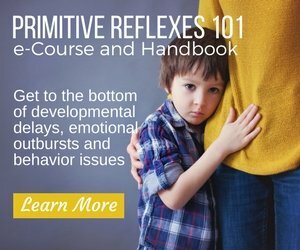 Is there any research about children with these types of disabilities? Hi Susan, many of our students have challenges with learning that often relate to something that may have happened to them at birth. It sounds like she probably has some challenges with her auditory system since she struggles to listen and follow directions. The movement therapy as well as music therapy is definitely where you want to begin. These two programs alone have made tremendous differences for our students. There is a lot of information available out there to help her or you can email me and I will give you better direction at info@ilsleanring.com. I have a lot of resources that can help. Where do you live so I may direct you a center that have programs similar to ours? Thanks for writing this! Would it be okay to print your photos for each exercise so I can laminate and put them on the shelf in my 3-6 classroom? I think the children would love to take them out as cue cards for individual movement work. I think that would be a wonderful idea! No problem at all! 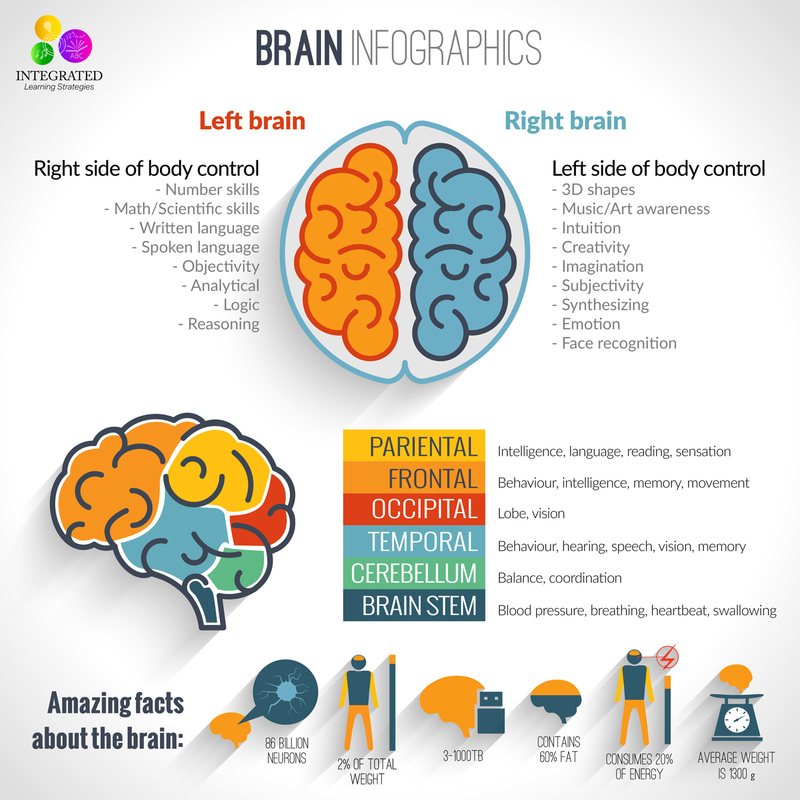 It is ‘parietal’ not ‘pariental.’ Such a grammatical error in a diagram of brain functions is so alarming that it makes me question the scientific validity of this entire article. Also, it is a bit redundant to define Occipital as ‘lobe’ seeing as how all of those are lobes of the brain with the exception of the cerebellum and brain stem. It would help to have citations to journals with studies that substantiate this theory. Thank you so much for your comment. The graphic you see in the article is for informational purposes only. It was purchase from a stock photo website so unfortunately we don’t have control over any spelling errors that are included. The graphic is merely for visual purposes. Thank you for bringing it to our attention. Sixth grade PE makes total sense now. Wow, just took it for granted. Many people don’t always know the benefits, but it can really help the kids learn. I bet they had a wonderful time in P.E. I’m not trying to be a jerk but I’m a physical therapist and it bothers me that there are so many mistakes. Your graphic is incorrect. 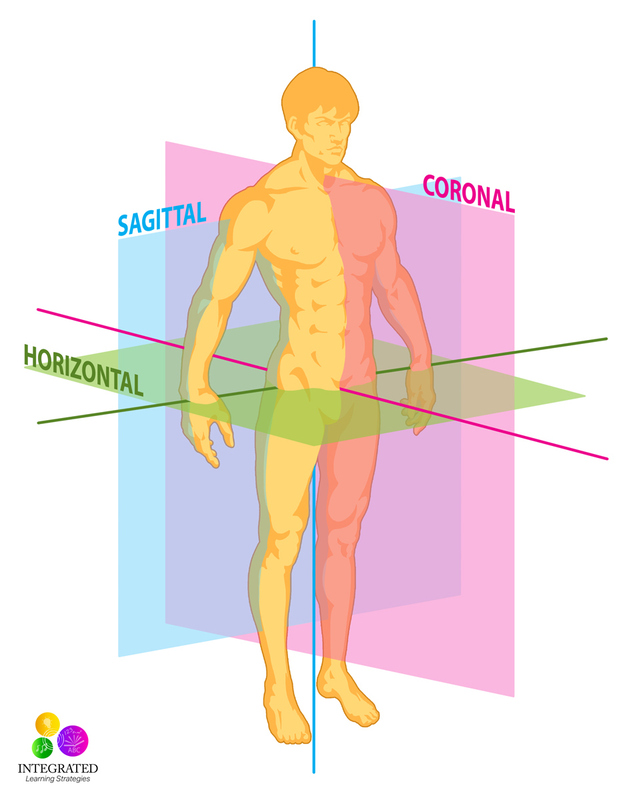 The sagittal plane divides the body into R and L sides, the frontal plane divides it into front and back (or dorsal and ventral), and the transverse plane divides it into top and bottom. Hi Julie, thank you for your feedback. The image was purchased on a stock photo website and is only meant to show how the body is divided. The incorrections were made by the designer and is not meant to reflect what we are discussing in the article. Thanks! This was a great article! It reinforced my practice of crossing the midline with all of my students. As an IS, I sometimes second guess using precious pullout time to do these exercises, but it is time well spent. That is wonderful news! I’m so glad it was helpful and that you can do these activities with your students. It will really help them excel in their studies. this sounds a bit too easy. If such a simple procedure could work such miracles, surely it woul be well known. It does seem pretty simple, but you’d be surprised how many children walk through my door that can’t do these simple activities. We have to start many of them from the beginning and work our way up to harder activities. It’s amazing how many parents notice a difference in their child within only a few weeks. However, you are right, this is not the only intervention needed. There are many different programs we implement in addition to movement therapy that help all areas of the mind and body. There really is no one solution that is a perfect match for everyone. Thanks for a very helpful article. I am going to try these out on my son who is battling with the first year at school. Great! That’s wonderful. I hope they are helpful and make a difference for him. OMG someone else that agrees with me. I was a preschool teacher when my boys were in elementary school I went there at naptime for my little ones to take their classes out for recess cuz the teachers wouldn’t had many disputes with that school system, and I didn’t sit in a chair and watch them I ran and played with them like I did with my preschoolers. I did it cuz my son was an active child and got in trouble cuz he just couldn’t sit for 6hrs. And they wanted me to put him on drugs I was adamant about not doing that. I’m so glad you did that! I wish more parents would do the same. We definitely do have ways to help our kids, even while they are in school. I bet it helped them tremendously, especially with attention and focus. I hope more parents follow your great example. Thank you!